This is definitely one of the cooler markets I’ve been to. 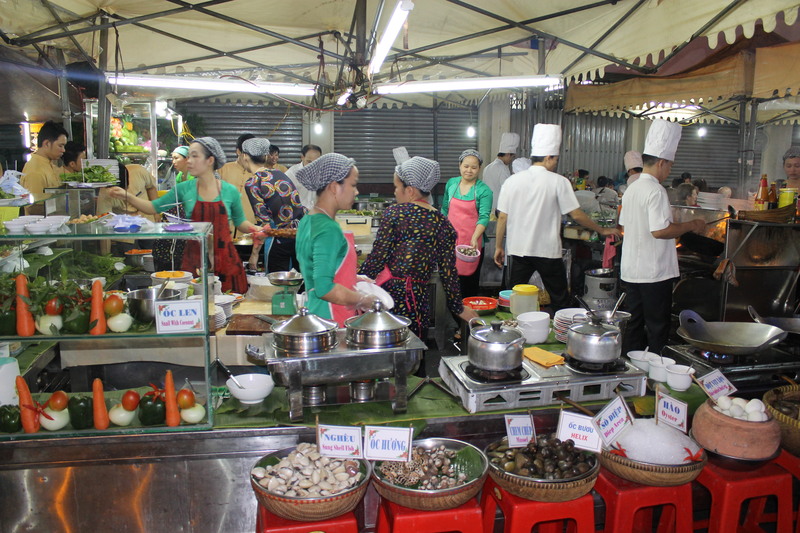 I’d read a little bit about it online when I Googled “night markets in Ho Chi Minh City,” learning that there was a day market there, housed in sheds and mostly undercover, but it really came into its own at night. The regular market shuts down at around 6pm, and then the mayhem begins, which we learnt the hard way. Sib and I left our hotel room at around 5.30pm, ready to eat our weight in street food (we’d heard it was pretty good there). We figured if the market started up around 6.30pm, we’d have an hour to find our way (without a map, relying solely on the lovely doorman’s instructions, vaguely pointed to us from the hotel lobby) and dawdle a little in the process. When we arrived, we found the day time market still open, so we took a quick wander around, stopping to purchase some green tea. We became suddenly very aware of the fact that all of the stalls seems to be packing up at once, quite abruptly, and we were clumsy nuisances tripping over semi-collapsed trestle tables and garbage bags; we stumbled back out to the street, surveying our options. 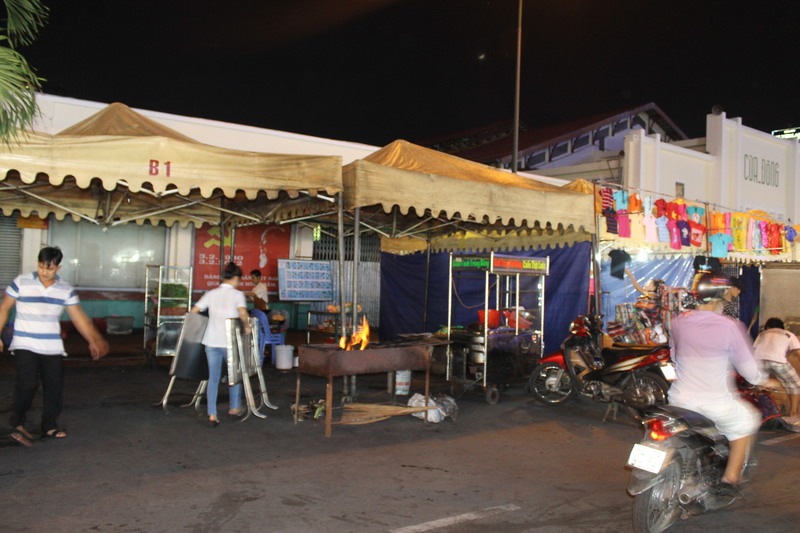 We decided to take a walk around the outside of the market to see if we could work out where this night market would be set up. What happened next was without a doubt one of the most comical, peculiar, preposterous thing I think I’ve ever seen. We looked up the street and saw a line of men and women running tents and pergolas down the street, in amongst the traffic! 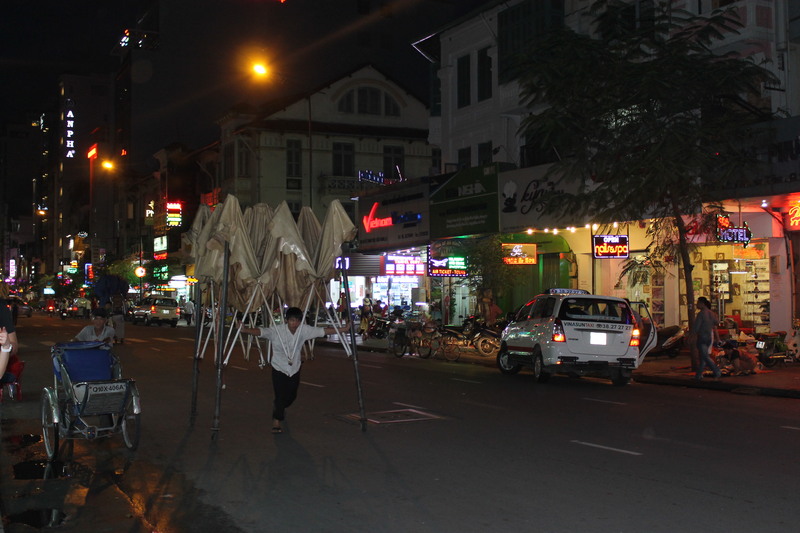 As we watched on, we witnessed the set up of the night market; it was mental. Complete madness. I don’t know how else to describe it. One moment, the area was empty, a few minutes later, the marquees we’d seen being wheeled down the street at breakneck speed were up, being wired with lighting and cooking stations were being fired up. A few minutes later, hand bags and watches were starting to come out of large sacks, being carefully laid out. We were stunned. We’d never seen anything like it! We decided to go grab a cold drink at a café and wait another 30 minutes or so to give the market a chance to set up properly. When we returned, it was ready. I really couldn’t believe the speed and efficiency with which it was all done – if I hadn’t seen it myself, I’d have never believed it. The market itself was pretty good – small, lots of stuff to appeal to tourists, handicrafts, clothing, designer knock offs and what not. But it was the food that was the best. We stopped at what seemed to be the world’s most fabulous pop-up restaurant, a well oiled machine commandeered by the calmest kitchen crew I’ve ever seen, not the least bit phased by the ridiculous crown already lining up to be seated, and waiters dressed in smart waist coats. 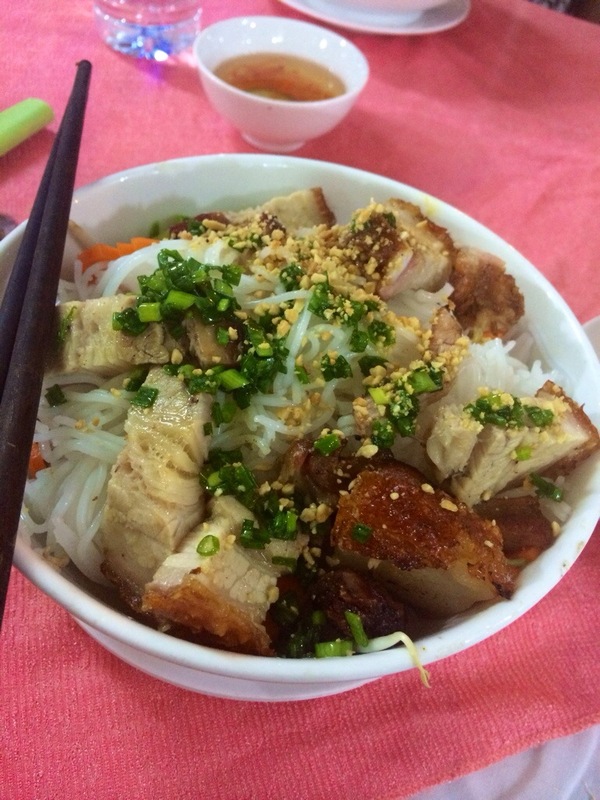 We went with our favourite Vietnamese dish for dinner – bun cha. I had the roast pork. It was perfect. 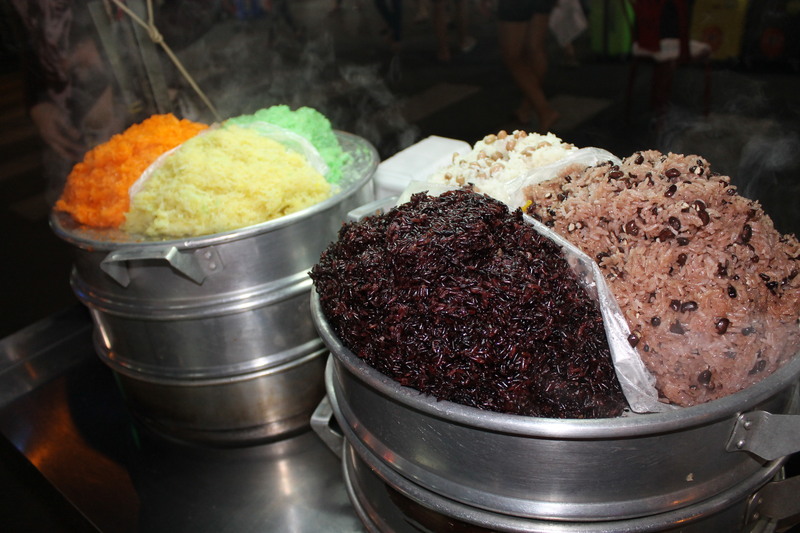 We weren’t planning on dessert, but when we saw this cart with 6 different types of sticky rice, we changed our minds and took home a little polystyrene tub with a small scoop of each to share, smothered in coconut milk. Just wow.